Mwai Kibaki (November 15, 1931 - ) is a Kenyan politician. He was the third President of Kenya, serving from December 2002 to April 2013. Kibaki was previously Vice President (1978-1988) under Daniel arap Moi, and has held several other cabinet positions, including Minister for Finance (1978-1981), Minister for Home Affairs (1982-1988), and Minister for Health (1988-1991). After graduating from Makerere University College, Uganda, he taught economics there from 1958 until 1960. That year, he was involved in founding the KANU party. He became a member of parliament in 1963. He broke with Moi in 1991, when he founded the Democratic Party and contested the presidential election. Moi won. On his second attempt in 1997, he came second but the following year he became official leader of the opposition. When Moi retired, he stood against Moi's chosen successor and won, becoming Kenya's third President. He was baptized Emilio Stanley by Italian missionaries in his youth but he rarely uses this name. He was sworn in on December 30, 2007, for his second term as president of the Republic of Kenya after controversially emerging winner of an election that was marked by accusations of fraud and widespread irregularities that have led to civil unrest. However, his presidency saw an annual percentage point rise in the gross domestic product. Although he initially rooted out corruption, this remains endemic. His style of leadership, like that of his two predecessors, was authoritarian. Kibaki increased the power of the presidency at the expense of parliament. For genuine democracy to develop in Kenya, the legislative branch needs to be strengthened, decision-making needs to be shared more widely and more people need to be able to participate in the political process. Kibaki's regime was described as semi-patrimonial; cabinet posts were alleged to be a form of largess to those who supported the president, regardless of their interest in serving the nation or their competency to handle a ministerial portfolio. Born in Gatuyaini village in Othaya division of Nyeri District, Kibaki was the youngest son of Kikuyu peasants Kibaki Gĩthĩnji and Teresia Wanjikũ (both now deceased). He was educated at Gatuyainĩ School (two years), Karĩma Mission School (three years), Mathari Boarding Primary School (between 1944 and 1946). Family oral history maintains that his early education was made possible by his much older brother-in-law, Paul Muruthi, who believed that Kibaki should not be baby-sitting his little nephews and nieces for his older sister. He studied at the prestigious Mang'u High School between 1947 and 1950 and obtained the maximum possible score in his high school terminal examinations. Kibaki was eager to join the army after high school, but due to a ruling by Walter Coutts, the Chief colonial secretary, people from GEMA communities were prevented from the British army. He studied Economics, History and Political Science at Makerere University College, Kampala, Uganda. During his studies, he was chairman of the Kenya Students' Association. In 1955, he graduated as best student of his class, and was therefore awarded a scholarship to undertake further studies in the United Kingdom, obtaining a B.Sc. with distinction in Public Finance at the London School of Economics. After obtaining his Master's degree, he became an economics lecturer at Makerere. In early 1960 however, he gave up his job to become executive officer of Kenya African National Union (KANU). He helped to draft Kenya's constitution. In the 1963 elections, he took the then Donholm Constituency (subsequently called Bahati and now known as Makadara) in Nairobi. He has been a member of parliament (MP) ever since. His election was the start of a long political career. Appointed Assistant Minister of Finance and chairman of the Economic Planning Commission in 1963, he was promoted to Minister of Commerce and Industry in 1966. In 1969, he became Minister of Finance and Economic Planning where he served until 1978. Moving his political base from Nairobi to his rural home, he was re-elected to parliament in 1974 to represent his native Othaya Constituency. The same year, Time magazine rated him among the top 100 people in the world who had the potential to lead. He was re-elected Member of Parliament for the same constituency in the subsequent elections of 1979, 1983, 1988, 1992, 1997, and 2002. When Daniel arap Moi succeeded Jomo Kenyatta as President of Kenya in 1978, Kibaki was elevated to the Vice Presidency, but was allowed to keep the Finance portfolio, which he exchanged for that of Home Affairs in 1982. Kibaki fell out of favor with President Moi in 1988, was dropped as Vice President and moved to the Ministry of Health. In December 1991, only days after the repeal of Section 2A of the constitution, which restored the multi-party system, Mwai Kibaki left KANU and founded the Democratic Party (DP). He came in third in the presidential elections of 1992, and was second in the 1997 elections. In January 1998, Mwai Kibaki became the leader of the official opposition with the Democratic Party being the official opposition party. In preparation for the 2002 elections, Kibaki's Democratic Party affiliated with several other parties to form the National Alliance Party of Kenya (NAK). NAK allied itself with the Liberal Democratic Party (LDP) to form the National Rainbow Coalition (NARC). On December 27, 2002, NARC won a landslide victory over KANU. Kibaki got 62 percent of the votes in the presidential elections, against only 31 percent for the KANU candidate, Uhuru Kenyatta. On December 30, 2002, still nursing injuries from a motor vehicle accident and in a wheel chair, Mwai Kibaki was sworn-in as the third President and Commander in Chief of the Armed Forces of the Republic of Kenya. Kibaki's first cabinet was a careful balancing act with one Minister or Assistant Minister coming from each of Kenya's 42 areas. His presidential style was very "hands-off," unlike his predecessor, who attempted to control everything from the center. Mwai Kibaki and Mrs. Kibaki with U.S. President George W. Bush and Mrs. Laura Bush at the White House during a state visit to Washington, D.C. in 2003. In November 2004, in an ABC News interview with Peter Jennings, former U.S. President Bill Clinton identified Kibaki as the one living person he would most like to meet "because of the Kenyan government's decision to abolish school fees for primary education." Clinton added that, by providing free and compulsory primary education, what Kibaki had done would affect more lives than any president had done or would ever do by the end of the year. The free education program saw nearly 1.7 million more pupils enroll in school by the end of that year. Clinton's wish was granted when he visited Kenya in the summer of 2005 and finally met president Kibaki on July 22. The 2005 Kenyan constitutional referendum was held on November 21, 2005. The main issues of contention throughout the drafting of the constitution were over how much power should be vested in the Head of State (the President, in this case). In previous drafts, those who feared a concentration of power in the president added provisions for European-style power-sharing between a ceremonial President elected via universal suffrage and a Prime Minister in Cabinet appointed by the President. However, the final draft of the constitution retained sweeping powers for the Head of State, which were however well checked by other branches of Government, including Parliament. Though supported by Kibaki, some members of his own cabinet and the main opposition party mobilized a powerful campaign that resulted in a majority of 58 percent of Kenyan voters rejecting the draft. As a consequence of this, Kibaki made a historic and decisive political move on November 23, 2005, by dismissing his entire cabinet in the middle of his administration's term. About his decision Kibaki said, “Following the results of the Referendum, it has become necessary for me, as the President of the Republic, to re-organize my Government to make it more cohesive and better able to serve the people of Kenya." Although the dismissal of individual officials is commonplace in government, the dissolution of the cabinet in its entirety is rare. The only members of the cabinet office to be spared a midterm exit were the Vice President and Minister of Home Affairs, Moody Awori, and the Attorney General whose position is constitutionally protected. The Cabinet was thereafter appointed, but some MPs who were offered ministerial positions declined to take up posts. On July 24, 2006, Narc-Kenya, a new political Party set up by Kibaki allies won three out of five parliamentary seats. This indicated Kibaki's government had recovered from the defeat at the constitutional referendum. Vision 2030, a scheme to raise annual GDP by 10 percent was unveiled by Kibaki on October 30, 2006. The prudent management of the economy under Kibaki has seen continued Kenya GDP growth during four straight years from a low 0.6 percent (real -1.6 percent) in 2002 to 3 percent in 2003, 4.9 percent in 2004, 5.8 percent in 2005, and 6 percent in 2006. GDP growth of 7 percent is projected for 2007, a very significant recovery from total decay preceding Kibaki's presidency. As a direct result of the consistent reforms undertaken by Kibaki's government, infrastructure rebuilding has been going on in earnest, and all the sectors of the economy have recovered from total collapse pre-2003. On November 15, 2006, he reinstated Kiraitu Murungi, who had stepped down to allow for independent investigations of corruption allegations in the Anglo-Leasing scandal, as Energy minister, and George Saitoti, who had been previously accused in connection with the Goldenberg scandal, as Education minister. Both the ministers were exonerated in the investigations. On January 26, 2007, President Kibaki declared his intention of running for re-election in the 2007 presidential election. Kibaki was initially considered the front-runner in the presidential election, although he was subsequently overtaken in the polls by Raila Odinga. On September 16, 2007, Kibaki announced that he would stand as the candidate of a new alliance called the Party of National Unity, which will include a number of parties, including KANU, DP, Narc-Kenya, Ford-Kenya, Forum for the Restoration of Democracy-People, and Shirikisho. Kibaki began his presidential campaign on September 30, at Nyayo Stadium in Nairobi. Following the election, held on December 27, the electoral commission declared Kibaki the winner on December 30, 2007, placing him ahead of Odinga by about 232,000 votes in a hotly contested election. This was announced despite accusations by the ODM that the election was rigged. Odinga accused Kibaki of fraud and violence broke out in some places. Kibaki was immediately sworn in for his second term, calling for the "verdict of the people" to be respected and for "healing and reconciliation" to begin. Independent election observers have since declared that the elections were marred with irregularities on both sides, but especially at the final vote tallying stage. A group of eminent persons of Africa, led by former United Nations Secretary General Kofi Annan, was called in to broker a peaceful solution to the political stalemate. This group enjoyed the backing of the UN, European Union, African Union and United States governments, as well as those of various other notable countries across the world. On February 28, 2008, Kibaki and Odinga signed an agreement on the formation of a coalition government in which Odinga would become Kenya's second prime minister. Under the deal, the president would also appoint cabinet ministers from both PNU and ODM camps depending on each party's strength in Parliament. The agreement stipulated that the cabinet would also include a vice-president and two deputy Prime Ministers. After being debated and passed by Parliament, the coalition would hold until the end of the current Parliament or if either of the parties withdraws from the deal before then. In July 2008, an exit poll commissioned by Steadman International was released, alleging that Odinga won the election by a comfortable margin of 6 percent, 46 percent to 40 percent, well outside of the exit poll's 1.3 percent margin of error. This contradicted the exit poll commissioned by Institute for Education in Democracy released immediately after elections which provided more detailed information. According to Murunga and Nasong'o, although Kibaki stood against Moi's chosen candidate, not much distinguishes his regime from his predecessors. He made a "show at combating corruption" but it remained as "endemic as ever." Western diplomats allege that corruption cost Kenya one billion US dollars since Kibaki's election. Like his predecessor, Kibaki manipulated politics to perpetuate his own rule. The alliance was really only a front for politicians who wanted an "opportunity for a stab at power." Kibuki failed to promote genuine democracy and concentrated more power in the presidency. Kenya is unlikely to progress towards democracy unless power is "devolved from the presidency" and the "institutions of governance are restructured." The "transition from Moi to Kibaki" illustrates that "a mere change of guard is not, in and of itself, a basis for a new mode of politics." Kenyan governance remains basically a patrimony; Kibaki allowed ministers "a wide margin of maneuver to ensure their continued support" and was seen as unlikely to crack down on ministerial graft "given his reliance on corrupt senior politicians." "His close allies have been implicated in multi-million dollar scandals," says Njeri. The first three Kenyan Presidents tended towards authoritarianism, hindering the development of democracy. In Kenya, this requires a stronger parliament, "decentralization of power to local democratic formations" and many more institutions for the "aggregation and articulation of interests"
However, the passage of Kenya's transformational 2010 Constitution, successfully championed by President Kibaki in the Kenyan constitutional referendum in 2010 was a major triumph and achievement, which went a long way into addressing Kenya's governance and institutional challenges . With the new Constitution started wide ranging institutional and legislative reforms, which President Kibaki skillfully and successfully steered in the final years of this presidency. "His greatest moment was the promulgation of the new Constitution... It was a very deep and emotional moment for him," Kibaki's son Jimmy was quoted as saying. A proud looking but rather worn President Kibaki handed over the Kenyan presidency to his successor, Uhuru Kenyatta, on April 9, 2013 at a public inauguration ceremony held at Kenya's largest stadium. "I am happy to pass the torch of leadership to the new generation of leaders", said Kibaki. He also thanked his family and all Kenyans for the support they had given him throughout his tenure in office, and cited the various achievements his government. He is married to Lucy Kibaki (née Muthoni), with whom he has one daughter, Judy Wanjiku, and three sons, Jimmy Kibaki, David Kagai, and Tony Githinji. In 2004, the media reported that Kibaki has a second spouse allegedly married under customary law, Mary Wambui, and a common daughter, Wangui Mwai. Mary Wambui is said to be provided with state bodyguards and other VIP privileges. She is also a National Rainbow Coalition activist. After the news broke, the State House released an unsigned statement that Kibaki's only immediate family is his wife, Lucy and their four children. Kibaki belongs to the Roman Catholic Church and attends the Holy Family Basilica Church. Honors awarded Kibaki include an honorary doctorate in Economics (2004) and one in Law (2008) both from Nairobi and in Science from Masinde Muliro University (2008). ↑ State House, Kenya, State House profile. Retrieved December 23, 2008. ↑ James Tooley, Private schools for the poor: Education where no one expects it, Education Next. Retrieved December 23, 2008. ↑ BBC, Kenya's entire cabinet dismissed. Retrieved December 23, 2008. ↑ IRINCEA-306, Weekly Round Up. Retrieved December 23, 2008. ↑ IOL, Kibaki reinstates ministers after scandal. Retrieved December 23, 2008. ↑ Associated Press, Kenyan president announces new party affiliation for re-election bid. Retrieved December 23, 2008. ↑ 7.0 7.1 BBC News, Kenya president eyes re-election. Retrieved December 23, 2008. 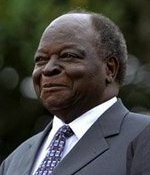 ↑ AFP, Kibaki: I deserve another term, News24.com. Retrieved December 23, 2008. ↑ ABC News, Kibaki re-elected Kenyan president: official results. Retrieved December 23, 2008. ↑ 10.0 10.1 BBC News, Kibaki named victor in Kenya vote. Retrieved December 23, 2008. ↑ Mike Pflanz and Kevin Shoesmith, Kenyan Poll Chief Pressured to Declare Result, The Telegraph. Retrieved December 23, 2008. ↑ Kevin J. Kelley, US-funded exit poll says Raila won elections, Daily Nation. Retrieved December 23, 2008. ↑ Wangui Kanina and Andrew Cawthorne, Early exit poll gives Kenya's Kibaki election lead, Reuters. Retrieved December 23, 2008. ↑ Godwin Murunga and Shadrack Nasong'o, Kenya: The Struggle for Democracy (London: ZED Books, 2007), 322. ↑ Murunga and Nasong'o (2007), 49. ↑ Murunga and Nasong'o (2007), 5. ↑ Murunga and Nasong'o (2007), 323. ↑ Murunga and Nasong'o (2007), 6. ↑ End of a decade of highs and lows for Mwai Kibaki Daily Nation, March 4, 2013. Retrieved December 19, 2014. ↑ Kibaki's Farewell Speech The Star, April 10, 2013. Retrieved December 19, 2014. ↑ For Kibaki, the curtain falls on 50 years of public service Daily Nation, April 5, 2013. Retrieved December 19, 2014. ↑ Emily Wax, New Kenyan Soap Opera: The President's Two Wives, Washington Post. Retrieved December 23, 2008. Ahluwalia, D.P.S., and Paul F. Nursey-Bray. The Post-Colonial Condition: Contemporary Politics in Africa. Horizons in Post-Colonial Studies. Commack, NY: Nova Science Publishers, 1997. ISBN 978-1560724858. Mbugua, Ng'ang'a. Mwai Kibaki: Economist for Kenya. Nairobi, KE: Sasa Sema Publications, 2003. ISBN 978-9966951205. Murunga, Godwin R., and Shadrack Wanjala Nasong'o. Kenya: The Struggle for Democracy. Africa in the New Millennium. London, UK: Zed Books, 2007. ISBN 978-1842778579. Ngunjiri, Njuguna, William Okoth Ong'aro, and Mburu wa Mucoki. President Mwai Kibaki: The Long and Bumpy Road to State House. Nairobi, KE: Immediate Media Services, 2003. This page was last modified on 19 December 2014, at 23:36.